Offering a wide range of Paper Cutting Blades. These are made from high quality raw material. We provide these in different specification to meet the diverse requirement of client. 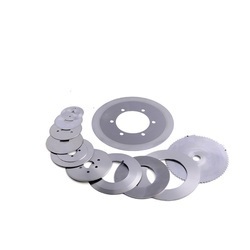 Leveraging our state of the art manufacturing unit we are able to supply these blades in bulk volumes within defined time frame to meet the requirement of the clients. Paper cutters are used in paper industries. They are used for giving shapes in paper, tissue paper thread cones etc. Looking for Paper Cutting Blades ?